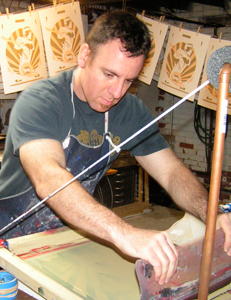 A lifelong lover of sports as well as a passion for history drove Chris Speakman to create "Sports Propaganda" prints. Conceptually inspired by the various war-like rivalries around sports as well as propaganda art from the 1940's, the art actively recruits fans to support their favorite team. Chris's work has been commissioned by companies such as Dunkin Donuts, Ironclad Authentics and Topps Trading Cards. His art was selected for the cover the of the 2011 MLB All-Star Game program and for the cover of the 2013 Beckett Magazine Art Issue. His work has also been featured in the Boston Sunday Globe, ESPN.com and on CBS-Boston TV. A 1998 graduate of the University of Hartford with a BA in Illustration, Chris Speakman grew up on the south shore of Massachusetts. He now lives in Waltham, Massachusetts. 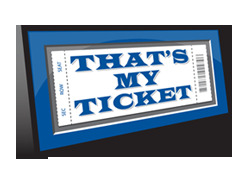 Sports Propaganda was acquired by That's My Ticket in January 2013 and as part of the merger, Chris took over the reigns of Creative Director for That's My Ticket. However and rest assured, all Screen Prints are and will continue to be made by Chris. If you would like to see how Sports Propaganda Prints are made please check out the short video above.